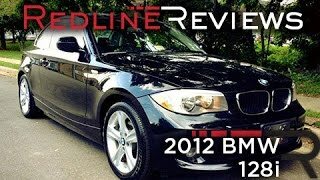 BMW released details about the second generation BMW 1 Series. The second generation 1 Series is even more comfortable, spacious, sporty and fuel-efficient than its previous model. The only rear-wheel-drive model in its class comes with a variety of engine options; both in diesel and gas engines. Check out further details after the jump. For the first time, all the petrol and diesel engines for the BMW 1 Series now feature new BMW TwinPower Turbo technology. A new generation of 1.6-litre petrol engines: BMW 116i with 100 kW/136 hp, BMW 118i with 125 kW/170 hp. Radically redesigned 2.0-litre diesel engines: BMW 116d with 85 kW/116 hp, BMW 118d with 105 kW/143 hp, BMW 120d with 135 kW/184 hp. Also scheduled for launch soon is the BMW 116d EfficientDynamics Edition, with a 85-kW/116-hp 1.6litre diesel engine and additional fuel-saving technologies that will keep CO2 emissions over the EU testing cycle down to just 99g/km. CO2 emissions*: 134–137g/km, emissions standard: EU5. CO2 emissions*: 129–132g/km, emissions standard: EU5. CO2 emissions*: 119–122g/km, emissions standard: EU5. CO2 emissions*: 115–118g/km, emissions standard: EU5. CO2 emissions*: 114–117g/km, emissions standard: EU5. The all-new, second generation BMW 1 Series occupies a distinctive niche within its segment, offering a unique and rewarding combination of agile, precise handling, improved aesthetics and innovative technology. It remains the only rear-wheel drive car in its class and, with a range of advanced TwinPower petrol and diesel engines, offers a sporty but fuel-efficient proposition boosted by BMW's EfficientDynamics technologies fitted as standard. The previous generation BMW 1 Series has had enormous success selling more than 2.2 million units globally, as well as being the first car in the premium compact segment. The elegant and dynamic styling of the new BMW 1 Series clothes a car that's 83mm longer, 14mm wider and 30mm longer in the wheelbase than its predecessor. These dimensions create a car with increased cabin dimensions and, thus, greater interior comfort. 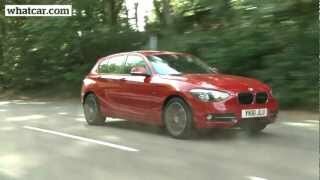 The new BMW 1 Series goes on sale in the UK on 17 September 2011, with a choice of three diesel and two petrol engines. 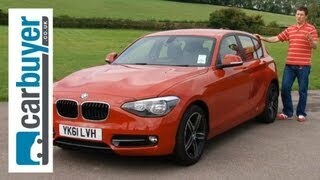 Prices start at £19,375 otr for a BMW 116i ES. The elegant and dynamic styling of the second-generation BMW 1 Series clothes a car that's 83mm longer, 14mm wider and 30mm longer in the wheelbase, creating an even more sporty design. The drivetrain layout, with a longitudinally mounted in-line engine at the front and rear-wheel drive, is unique within the compact segment. This not only improves the 1 Series' handling, but is also reflected in its design, with typical BMW proportions: a long bonnet and wheelbase, and a set-back cabin. This youthful, lively design is dominated from the front by the large BMW kidney-shaped grille, boldly shaped headlamp units and three-section air intake. The grille is tilted forwards, further emphasising its sporty stance. Viewed in profile, the dynamic proportions of the new BMW 1 Series are even more apparent. The gently sloping roofline, sporty, angled rear window and flat side windows give the car the look of a coupé, while the Hofmeister kink extends well into the C-pillar. A wide rear door aperture aids access to the rear seats. Wide-set wheel arches further reinforce the powerful impression created. The interior of the new BMW 1 Series features a fresh and youthful combination of typical BMW design features and innovative treatments, with surfaces created from high quality, precision-finished materials. The characteristic BMW driver focus is apparent in the angled displays and controls of the central instrument panel, while the interior surfaces are layered, giving the interior of the new BMW 1 series an organic look and feel. Given the additional length and width of the new model, it is no surprise that the interior provides even more occupant comfort and convenience than its predecessor. Not only is the driver ensconced in a sporty but comfortable environment, but rear-seat passengers also benefit from a further 20mm of legroom. In addition, storage space has been given careful consideration, with large front door pockets, two cup holders on the centre console and a roomy glove compartment. The new BMW 1 Series has an additional 30 litres of luggage space compared to its forerunner, taking the total to a generous 360 litres. By lowering the standard 60/40 split rear seats this can be increased to a maximum of 1,200-litres, with the added benefit of a flat load surface. BMW's revolutionary iDrive system is available as standard on cars with SE specification and above, comprising of a controller on the centre console, Favourites buttons and a freestanding, high-resolution 6.5 inch flatscreen monitor. This display is used for all information, entertainment, telecommunications and navigation functions, should satellite navigation be specified. The new BMW 1 Series is available from launch with a choice of two, new generation, four-cylinder petrol engines and three, redesigned, four-cylinder diesel units. For the first time, a BMW four-cylinder petrol engine has been fitted with TwinPower Turbo technology. The new 1.6-litre unit is of all-alloy construction and features a twin-scroll turbocharger, a High Precision Direct Injection system, VALVETRONIC variable valve control and Double-VANOS variable camshaft control. In addition, the new engine features BMW's EfficientDynamics technologies, which aims to continually increase driving enjoyment while reducing fuel consumption and emissions. 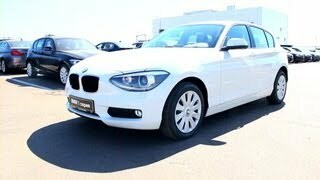 The BMW 118i produces a maximum output of 170hp at 4,800rpm, and a maximum torque of 250Nm. Peak torque is attained between 1,500rpm and 4,500rpm, demonstrating the flexibility of this new engine. It's no surprise, therefore, that the 118i will sprint from zero to 62mph in just 7.4 seconds, going on to a maximum speed of 140mph. The efficiency of this new engine is proved by a combined fuel consumption of 47.9 mpg, and CO2 emissions of just 137g/km. The new BMW 116i's four-cylinder TwinPower engine develops 136hp at 4,400rpm and a maximum torque of 220Nm between 1,350 and 4,300rpm, providing a more dynamic drive that its predecessor. This is illustrated by the 8.5 seconds the car takes to reach 62mph from a standing start, and the 130mph top speed. Even more impressive is the combined fuel consumption of 49.6mpg, and CO2 emissions of just 132g/km, going up to 134g/km when teamed with the eight-speed automatic transmission. BMW already has a worldwide reputation for award-winning excellence with its diesel engines. In the new BMW 1 Series, BMW has chosen to push this advantage further still, increasing both power output and fuel efficiency. Modifications to the 2.0-litre engine include aluminium crankcases, reduced engine friction, thermodynamically optimised turbochargers with variable turbine geometry and next-generation commonrail injection. The new BMW 120d embodies this technological advance, offering an increase of 7hp over its predecessor, taking maximum power to 184hp at 4,000rpm. Torque is also increased with an additional 30Nm available, equalling a substantial 380Nm between 1,750 and 2,750rpm. These figures equate to a 0 to 62mph time of just 7.2 seconds, and a maximum top speed of 142mph. However this performance is not at the expense of economy: the new BMW 120d manages 62.8mpg on the combined cycle, with CO2 emissions of 119g/km. The BMW 118d has a maximum output of 143hp at 4,000rpm, with strong peak torque of 320Nm between 1,750 and 2,500rpm. It accelerates from 0 to 62mph in 8.9 seconds, with a maximum speed of 132mph, yet manages 62.8mpg on the combined fuel cycle and emits just 118g/km of CO2. 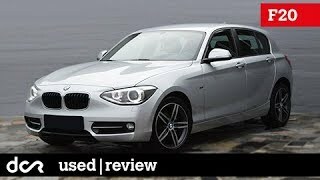 Finally, the new BMW 116d offers a particularly appealing blend of performance and economy. With a maximum output of 116hp and peak torque of 260Nm between 1,750 and 2,500rpm, the 0 to 62mph dash is completed in 10.3 seconds, before reaching a top speed of 124mph. This performance is matched to a combined fuel consumption of 62.8mpg, with CO2 emissions of 117g/km. The new BMW 1 Series is available with either a six-speed manual transmission or a new eight-speed automatic transmission. The latter is available in Sport configuration, featuring more dynamic gear changes and shift paddles on the steering wheel. The BMW 1 Series continues as a market leader through its suite of EfficientDynamic technologies, featuring extensive use of intelligent energy management systems, including Auto Start-Stop function in both manual and automatic transmissions - the latter a first-in-class with eight speeds. An ECO PRO mode, activated using the Drive Performance Control (included as standard), is a new feature on BMW's that adjusts various on-board systems to maximise efficiency. When in ECO PRO mode the throttle response is adjusted to encourage a more economical driving style. The extra economy created in ECO PRO mode is fed back to the driver, with the in-car displays showing the additional number of miles achieved. At a later date, the all-new 1 Series range will be expanded with the introduction of the BMW 116d EfficientDynamics model. This unique model will generate an output of 116hp whilst producing an average fuel consumption of 74.3mpg, but at the same time emitting an expected 99g/km of CO2. The new BMW 1 Series offers significantly improved comfort and unique handling thanks to its rear-wheeldrive, in-line engines, perfectly balanced weight distribution and advanced suspension technology. A wider track, 51mm at the front and 71mm at the rear, than its predecessor makes for an even more exhilarating drive. Suspension on the front axle is by double-joint cross-struts, the high aluminum content of this structure effectively reducing the unsprung mass, while noise levels have also been reduced and crash performance improved. At the rear an advanced five-link arrangement is used, while the electromechanical power steering offers excellent precision with no interference from the drivetrain. A raft of electronic systems increases both driving enjoyment and safety. These include optional Variable Sports Steering; Driving Stability Control (DSC) including Dynamic Traction Control (DTC) and an electronically locking rear differential as standard. DTC is activated in DSC Off mode, applying brake force to either rear wheel in the advent of wheelspin to maintain traction through a corner. In addition, a highly torsion-resistant body increases both responsiveness and passenger protection, and is complemented by a comprehensive range of safety equipment including front, side and head airbags. Prices start from £19,375 otr for a BMW 116i ES rising to £24,720 otr for a BMW 120d Urban or a BMW 120d Sport. The new BMW 1 Series offers the high level of standard equipment and a wide range of options expected of a premium segment car. The standard specification consists of a satin silver interior trim and Move cloth seats, with further interior trims and accent panels optional, as are Dakota leather seats or sports seats. Three standard and five metallic exterior paint colours are available from launch. Other additions to the standard specification of the new BMW 1 Series include a leather steering wheel, chrome exhaust and keyless start. Auto Start-Stop, six-speed manual transmission, 16-inch light alloy wheels, four airbags, DSC+, Drive Performance Control with ECO PRO, BMW Business radio with single CD player, air-conditioning, 60:40 folding rear seats, child seat ISOFIX attachments, Move cloth upholstery and leather steering wheel. SE: Freestanding high-resolution 6.5 inch flatscreen monitor and iDrive controller, Bluetooth hands-free facility with USB audio interface and a multi-function leather steering wheel with speed limiting function. BMW Sport: Sport style 17-inch star-spoke light-alloy wheels, Dark Chrome exhaust pipe and high-gloss black kidney grille, central air intake trim, side intake surrounds and rear bumper trim. Exclusive sport design sports seats, leather sports steering wheel, high-gloss black interior trim with Coral Red or grey accents. BMW Urban: Urban style 17-inch V-spoke light alloy wheels, chrome kidney grille with white slat sides and trim bar for the central air intake, amongst a host of stylish design details. Inside, Metro cloth/leather seats, leather sports steering wheel and an acrylic glass interior trim in black or white with Oxide Silver accents. The new BMW 1 Series offers a comprehensive and unique (for a compact car) selection of optional driver assistance systems and mobility services. These include High-beam Assistant, Adaptive Headlights, Park Assist, Reversing Assist Camera, Lane Departure Warning including Collision Warning, cruise control with brake function, speed-limit and no-passing information. In addition, occupants can benefit from internet connectivity, smartphone and music player integration, real-time traffic information, as well as web radio, Facebook and Twitter apps. BMW UK expects to sell circa 20,000 1 Series five-door models in its first full year.